Simon Kane was one of the many freaks created by the Creator over the years. His incredible telepathic abilities combined with his mental instability led to the Creator keeping Kane locked up in an isolation booth. This facility was power independently and provided its occupant with all of the comfort, entertainment and food he desired whilst also keeping his powers in check. When a fight between EXROE-5 and She-Dragon knocked out the power to the Creator’s facility, Simon Kane emerged from his chamber. His powers returned and he instantly caused thousands of people’s deaths by having them kill one another. 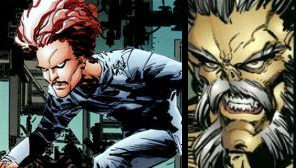 Dragon was able to fend off the telepathy through his healing factor and Kane was arrested. Simon Kane was kept sedated in Stronghold Penitentiary where the warden ordered him to have a lobotomy after radiation treatment failed to remove the threat of his powers. He was transported without sedation and used the Devastator to act his new body, breaking the pair of them out. The newly-dubbed Possessor made his move during a recruitment rally held in Washington, DC by the Special Operations Strikeforce. Dragon managed to kill the villain’s current host but this did not end his threat. Dr. Plucker had been forced to treat the Possessor’s original body, controlling its mutation into a new form. The Possessor believed that his “death” at the hands of Dragon had shown him the error of his ways. He now intended to rid the world of evil and began causing thousands of suicides, targeting anyone that had even the tiniest evil thought. Dragon made him realise the error of his ways and the Possessor committed suicide himself. In the reality that Dragon ended up in after a confrontation with Damien DarkLord, the Possessor had remained in his isolation booth. Dragon convinced him to use his telepathy in the war against CyberFace. The Possessor controlled the minds of any freaks near the White House to come to their aid during the final assault. Unfortunately for the Possessor, many of CyberFace’s minions were mindless robotic drones who killed him by shooting off his head.